Daphne Lee is an author and editor specialising in both fiction and non-fiction for children and young adults. Her picture books include a series of four books for pre-schoolers illustrated by Amir Shah Amiruddin: 1 Red Flower, A is for Anklet, If I Were a Star and Sweet Pink Posies (all MPH Publishing (Malaysia), 2007). 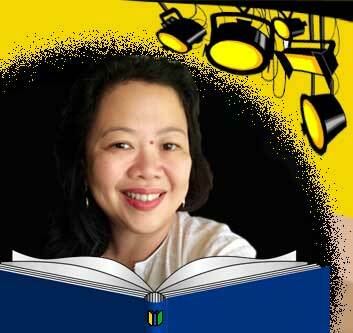 Daphne has a weekly column in the Malaysian daily newspaper The Star, focusing on children’s and YA books, and she also runs ezine Local, focusing on Malaysian and South-East Asian literature. She writes book reviews and commentaries at her blog The Places You Will Go, part of her website Head Shoulders Knees and Toes, while her website One Red Pencil focuses on her work as an editor and a teacher of creative writing. Daphne has served on several book-prize juries, and in 2010 she was nominated for the Astrid Lindgren Memorial Award as a promoter of reading. As an editor, Daphne has most recently worked with the three winners of the 2012 Scholastic Asian Book Award (SABA) – Bungee Cord Hair by Ching Yeung Russel; Not in the Stars by Pauline Loh; and Hidden in Plain Sight by Su-Lin Ang – and with Nury Vittachi and Luther Tsai on the first three books in their Magic Mirror series (all published by Scholastic Asia). 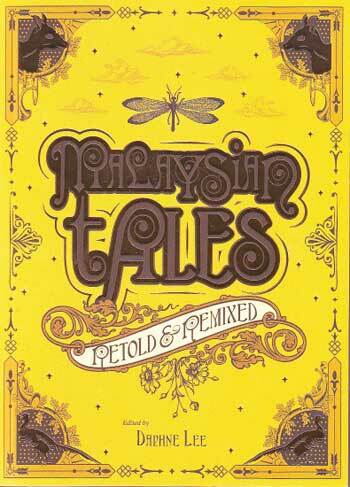 In 2011, Daphne conceptualised and edited Malaysian Tales Retold and Remixed, (ZI Publications (Malaysia), 2011), a collection of classic Malaysian stories given a contemporary twist. The idea for the project crystalised after Daphne discovered Angela Carter’s The Bloody Chamber and Other Stories and The Egerton Hall Trilogy by Adele Geras, who wrote the Foreword for Malaysian Tales Retold. Daphne invited Malaysian writers to contribute a contemporary take on traditional tales from either mythological or historical folklore, and the result is a sometimes beautiful, sometimes edgy and uncomfortable, and always relevant collection of stories that includes Daphne’s own intense and disturbing ‘Endless Night’. Daphne was born in Segamat, a small town in Johor, Malaysia’s southern-most state. She attended school locally and in Singapore and then studied in England. She lives in Kuala Lumpur with her three children and two cats, Charles and Boris-Doris (‘She’s a girl but I thought she was a boy at first, hence the name’!). Welcome, Daphne. Did you read a lot as a child? 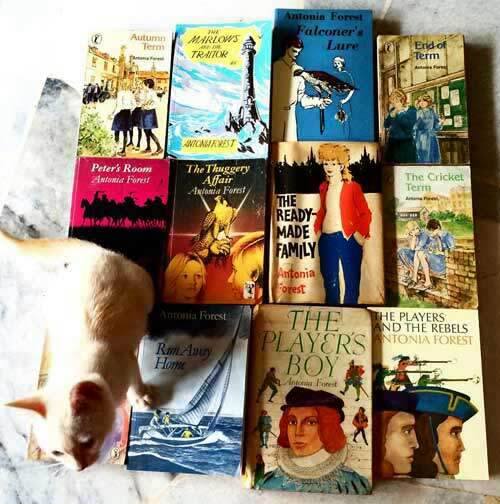 What kinds of books did you grow up with In Malaysia? Oh yes, I was read to a lot from as early on as I can recall, and I read a lot as soon as I knew how (not sure the age). I read mostly Enid Blyton and abridged versions of classics like Jane Eyre and Pride and Prejudice. I didn’t have a whole lot of children’s books so I re-read a great deal, and still do. I loved Little Women, the Katy Did books, and the Little House series. There were no restrictions so I even read Peyton Place. And other grown-up books like Anna Karenin, Brideshead Revisited, The Great Gatsby and Sister Carrie. And here’s a photo of my well-read collection of books by Antonia Forest, who is my favourite children’s author of ALL time. Daphne’s collection of books by Antonia Forest – with Boris-Doris. Which one is she sitting on?! When did you know you wanted to write for young people and work in the children’s book world? I’ve never particularly wanted to write for young people. I don’t think I’m good enough, or have very good ideas. I wrote a few picture books about eight years ago because I wanted to make books with Malaysian content, but I don’t think they were very good, and they are now out of print. I am, however, very interested in working to develop Malaysian children’s literature, and all kinds of Malaysian literature, for all ages. I know that in the past you have criticised the standard of children’s books in Malaysia, especially their lack of local authenticity – but more recently, there have also been glimmers of optimism and at the Asian Festival of Children’s Content (AFCC) in 2012, you really threw down the gauntlet to publishers – has that gauntlet been picked up, do you think, and can you take us through the issues here? I’ve often said that what the Malaysian book industry needs is commitment to developing quality content, and the stamina to go the distance. I’m not going to beat around the bush. I feel the right people in Malaysia don’t care about producing good children’s books. By ‘right people’ I mean those with the means to publish children’s books. You have these publishers who may or may not have good intentions, but they don’t seem to care about the quality of the books they are producing. 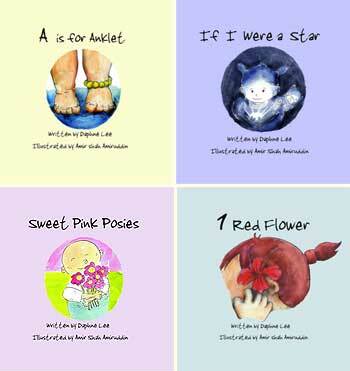 Please can you tell us about OneRedFlower Press? Actually, OneRedFlower Press no longer exists. There was no money to continue – I guess the person who had the money decided that it wasn’t worth their while. I don’t really know or understand why the imprint wasn’t given a chance to develop and grow. It’s been suggested that there was a lack of communication between the people involved in it, one of whom was me. It’s a shame because I think it could have produced good books. I’m sorry to hear that. 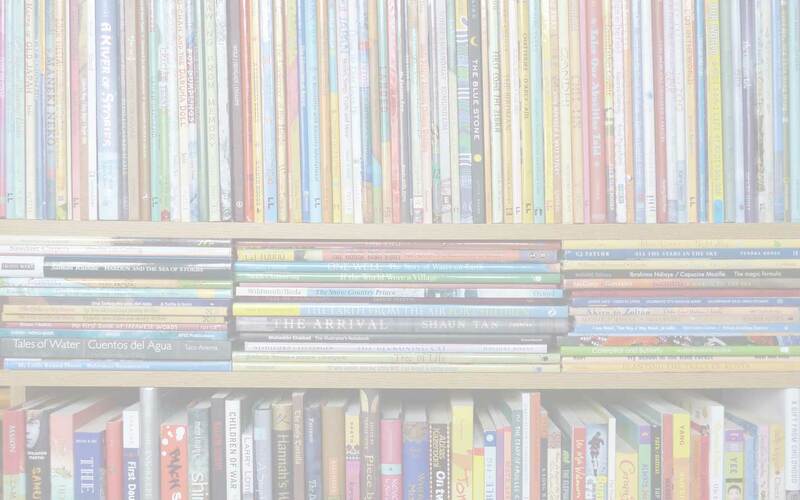 What about your own writing – can you tell us about your picture books? I don’t write for children anymore, not officially anyway. Once upon a time I wrote four picture books – simple concept books, letters, numbers, that sort of thing. I’ve also written picture books for the Kids Clubs of Club Med Malaysia (Cherating) and Phuket, and I do have to do some writing for Scholastic projects, but as far as my own stuff goes, I write for adults. It’s not a priority though. I see myself as an editor first and foremost. It’s what I enjoy doing best. You recently edited a collection of short stories, nearly all of them original, Malaysian Tales Retold and Remixed. How did the book come about? All the stories in that collection have their roots in traditional stories. The book came about because I thought it would be interesting to reinterpret the old tales. I admire the work of writers like Adele Geras, Angela Carter and Emma Donaghue all of whom have done wonderful retellings of fairytales, and I wondered what Malaysian writers would come up with if they were to re-tell some of our myths and legends. I also realised that Malaysians are not very familiar with these stories, so I thought the book would serve to introduce readers to the folktales of the region. The idea was to make the stories relevant to the 21st century Malaysian experience, but also to lead readers to the “original” works. I want to do another book that includes stories from other parts of south-east Asia, and in fact, I’ve confirmed the project with a local publisher. Is it necessary to know the ‘original’ versions of the stories? No, I don’t think it’s necessary. As in, I don’t think you need to know to understand the stories. However, people have said that my story (‘Endless Night’) makes more sense to them when they know it’s based on the legend of the Princess of Mount Ophir (‘Puteri Gunung Ledang’). However, some of other stories are totally different from the tales that they are based on. Personally, I do enjoy comparing the originals to the reworked versions, just because I enjoy thinking about parallels and also making connections between seemingly unrelated points. You make some very interesting points in your introduction, including the following: ‘Stories that are written down become fixed, unchanging. They stop acting as a mirror to the societies for which they are created.’ Could you elaborate on that a little further? I often wonder what form folktales and fairytales first took when they were first told. Impossible to say, really. What inspired them in the first place? A true event perhaps? A conspiracy theory? Were they purely the product of the imagination, but coloured by a way of life, the religious beliefs and superstitions of the storytellers, the politics of the time? To have survived to the present day, the stories would have taken many forms, especially when passed on solely through word of mouth. It’s only when they were recorded that their details would have stopped evolving and changing. I feel when something is written down, we feel obliged to stick to the story as laid down, in ink, on paper. When a story is just hearsay, we feel free to add and omit in a variety of ways. If our folktales were not written down, who knows which of them would still be told today. Also, which would continue to be told, but with details added, plots changed? I love the idea of writers continuing to retell these stories. Collections such as Malaysian Tales give them the ‘permission’ to change these stories to highlight different themes or discuss issues that are important or significant at the time of the stories’ telling. In this way, the story continues not just to live but to grow. For my next project, I’m not restricting writers to local tales. This is because many of us didn’t grow up with fairytales, myths and legends from this region. What I will say though is that the re-telling has to be localised. A story from Hans Christian Andersen, or a Persian myth through a Malaysian or Singaporean filter should make for interesting reading. 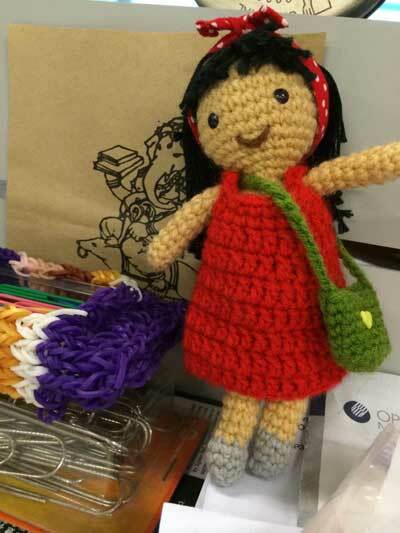 How vibrant is the contemporary children’s literature scene in Malaysia? I’m pretty much out of it, Marjorie. I write a monthly column that focuses on children’s and YA literature, or rather that’s what it started as, back in 2002 when it was a weekly. Now I write about children’s and YA books, and also issues that I think affect the writing and reading of these books. I write with young readers in mind. And I guess I also write for readers, no matter their age, who read children’s and YA books. What recent titles do you recommend? Local titles. I like the three recent SABA [Scholastic Asian Book Award] winners, published by Scholastic Asia. I especially like Hidden in Plain Sight because it’s exactly the sort of book I wished for when I was a child and reading Enid Blyton mysteries – an adventure set locally, with local children whom I could identify with. I’m wrapping up a couple of short story collections that will hopefully see the light of day next year. And I’m editing several children’s chapter books for Scholastic. Thank you, Daphne – I love all the questions you raise about the roots of folklore and the influence of the stories today. I really look forward to the next collection. Before we say good-bye, we’re just going to put you under the MWD Spotlight…. I don’t know if I’ve read such a book. I used to ‘Malaysianise’ books like Little Women, the Famous Five, What Katy Did and Anne of Green Gables precisely because there was nothing truly Malaysian I could read. I mean, I’d re-write favourite chapters using local names and settings. I have no real preference. The words are what count, not the format/medium. 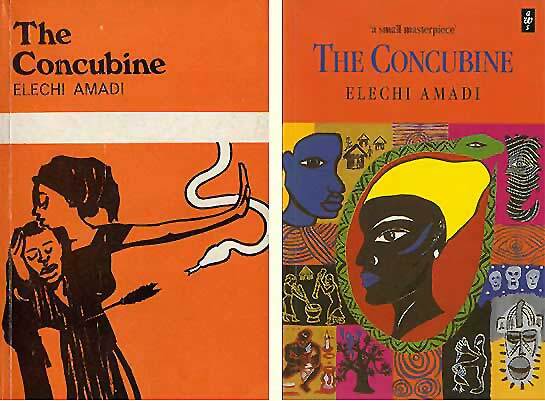 The Concubine by Elechi Amadi, a Nigerian writer. We sometimes see writers collaborating (for example Gaiman and Pratchett on Good Omens), but have any illustrators collaborated? I’d like to pair Allen Say and Shaun Tan. Suzy Lee and Oliver Jeffers. Freya Blackwood and Ed Young. David Wiesner and John Burningham. I’d like to see how these different artists fit and work together to tell stories. They should make wordless picture books. Hmm … I don’t like lying on the beach (I’m not a big fan of sand, haha) and I’m not fit enough to climb a mountain. I prefer a holiday sitting in a café, drinking good coffee. I like city holidays. I love visiting museums and art galleries, and people-watching in cafes and parks. Computer, smart phone (Evernote app), scribbled on the back of an envelope or any handy scrap of paper. A doll I had a friend make for my daughter I-Shan. It’s supposed to be I-Shan actually. When I returned to work at the newspaper, I-Shan suggested I take her with me to keep me company☺. Visit Prince Edward Island in Canada, because of Anne of Green Gables and Anne of Avonlea. I have a mild form of trypophobia. My column is due! Help! Plus, I have manuscripts to read, and some articles to sub-edit (for the newspaper). Adele Geras, Amir Shah Amiruddin, Angela Carter, Antonia Forest, Bungee Cord Hair, Children's and YA Books from Malaysia, Ching Yeung Russel, Daphne Lee, Hidden in Plain Sight, Luther Tsai, Magic Mirror series, Malaysian Tales: Retold & Mixed, MPH Publishing (Malaysia), MWD interview, Not in the Stars, Nury Vittachi, Pauline Loh, SABA (Scholastic Asian Book Award), Scholastic Asia, Su-Lin Ang, The Bloody Chamber and Other Stories, The Concubine by Elechi Amadi, The Egerton Hall Trilogy, ZI Publications. Bookmark.